First I will state the problem we will solve. Imagine you want to listen to an event (e.g. Android OS Notifications or Bluetooth state) in multiple parts of the application but only when any of these parts is interested in the information. The event listener must be registered only when the first client in the app is interested in it and it must un-register as soon as nobody is interested anymore. When a new client subscribes to the event it should receive immediately the last event already sent to existing clients so clients are always in sync. In this article we will explore how to solve this problem by mixing different RxJava components. You should be familiar with concepts like Subjects, Replay and Connectable Observables before diving in, because this article will help you understand the nuances of each component. Note: This article discusses RxJava 1, if you use RxJava 2 these solutions still work, although a simpler method is mentioned in the last paragraph. Now I will illustrate the problem with a metaphor. 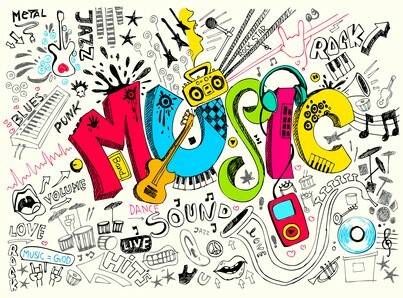 finally, when the last person leaves the room, the music stops playing and the sound system turns off automatically. The solution will be introduced in small steps -in the form of a cooking recipe- explaining the reasons to add each ingredient and what problem each one tries to solve. 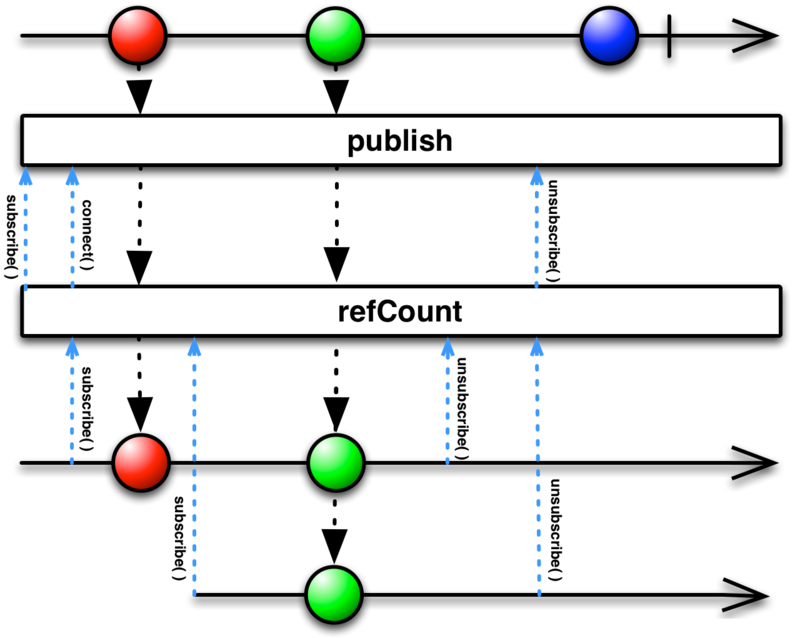 The first RxJava ingredient that covers most of the needs of our goal is a BehaviorRelay from RxRelay (a.k.a. safe BehaviorSubject). This will provide subscription/unsubscription events, multicasting to multiple observers like a hot observable and finally a replay of the last emitted value to new observers. This works fine, except for the fact that every new subscription to the observable causes an extra registration to the listener and every unsubscription from the observable causes an extra un-registration from the listener, even if there are more observers still subscribed to the observable. This recipe can not be used with multiple concurrent observers. A simple fix to this problem is to combine the BehaviorRelay with the share() operator. This will cause the doOnSubscribe() method in the source observable to be triggered only once when the first observer subscribes to the stream and similarly the doOnUnsubscribe() will be called only once when the last observer unsubscribes from the stream. We are close but not quite there yet because now when a second observer subscribes it doesn’t get any value until a new event is emitted. 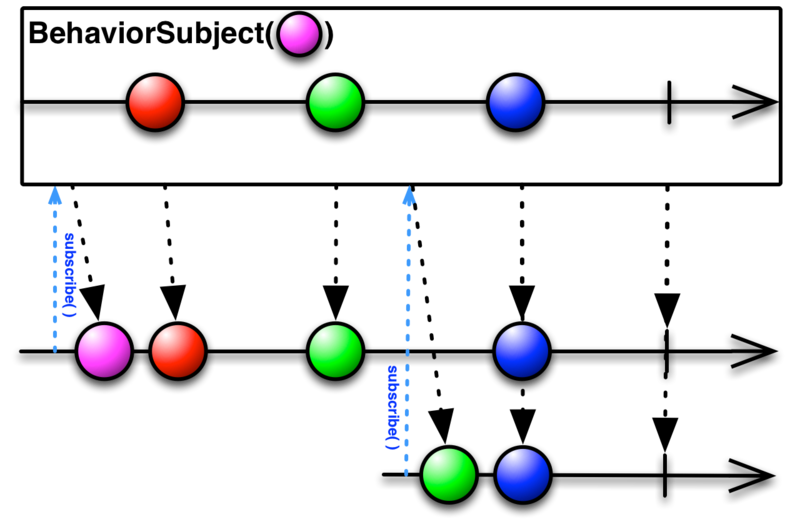 Consider an event was already emitted to previous observers when a new observer subscribes, wouldn’t it be nice if we can emit the last known value to new observers immediately? 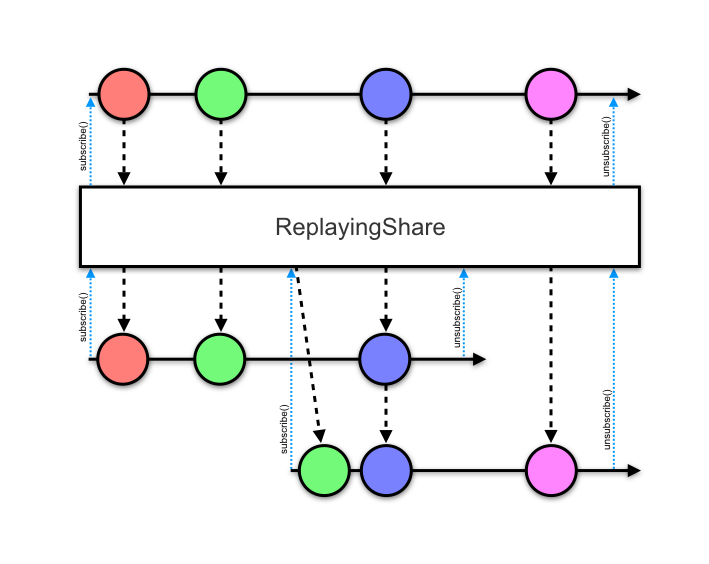 The answer to this problem is to replace .share() with RxReplayingShare and since now the replay cache is part of the ReplayingShare object we should use a PublishRelay instead of the BehaviorRelay. One example to apply this technique is in Android services that need to run only on demand when some part of the app is interested in the events produced by the service, these services keep producing elements until nobody is interested in them anymore and then they shut down. I personally love how you can compose different components of RxJava to create your own recipe to solve a very specific problem. Surely there must be other ways to mix RxJava ingredients and obtain similar results, so I would love to hear in the comments your alternative recipe to cook the same results. Gourmet tip: Recently introduced factory Observable.create(emitter) has been designed to cover the register/unregister listener use case; hence, the problem stated here could also be solved using create() to obtain similar results. The right combination is create(emitter) with ReplayingShare. Thanks to Jolanda Verhoef and Olaf Achthoven. Full time life student and developer - I love to learn, share and improve myself and the things I build.